The Multistation Power Tower (model MK-4001A or 361) by HappyBuy has a 550 lb. total weight capacity and includes a pull-up and dip bar station for performing different bodyweight exercises like dips, push-ups, chin-ups, and pull-ups. It is basically a budget-priced workout station for home use by one or two people on a daily basis, but not for fitness centers where tens of people would be using it every day. Despite having a sturdy steel frame and impressive 550-pound user weight capacity it would not be adequate for commercial fitness centers. The 361 model HappyBuy Power Tower includes a red punching ball, red gloves and the padded backrest and arm cushions and more. 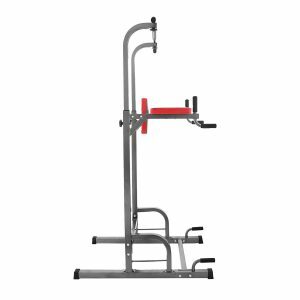 The MK-4001A that is about fifty dollars cheaper as of today, is just the frame with a slightly different design but works as a power tower you can still do your push-ups, chin-ups, and dips along with other exercises. In both models, you can adjust the height of the bar between 55 and 88 inches. The back cushion measures 10.5 x 12 inches and the arm cushions are 11.5 x 55.5 inches each with a height of 51 inches off the ground. This is a solid power tower with a sturdy and durable steel that is powder coated to protect it from scratches or other damage. It is designed to last you a long time as long as you don’t treat it too rough. You’ll find rubber grips on both models but the very dense foam is available on the more expensive 361 model. You can either have it as the only unit to do a variety of body weight exercises or add it to your home gym with whatever equipment you may already have. This will help you with muscle toning and strengthen as a decent resistance training unit and as long as you’re not an advanced trainer you don’t have to pay for the costly gym fees you may or may not use. You can train your chest, shoulders, arms- triceps, and biceps, back and different leg muscles. Not sure if this happened to you before but roughly 80% of Americans that join a gym and pay for annual membership fees quit after a little while as they get lazy or whatever. If this is the case in other countries as well, which it probably is, then there is a serious amount of money wasted on unused gym memberships globally. The shipping weight for the 361 model is 52 pounds and 38 pounds for the cheaper and more basic MK-4001A model. Both units are easy enough to put together with the easy to understand instructions and tools. They are sturdy, functional, versatile, durable, nice looking and if we ask our opinion it is definitely worth paying fifty dollars more for the extra features and design of the 361. For those on a budget, they are both great value, low priced but good quality multi-station power towers.